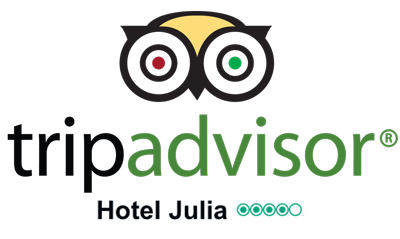 Hotel Julia is situated in Via Rasella 29, really close to Trevi Fountain, Spanish Stemps, Barberini Square and the famous Via Veneto. The buinding is easily reachable by publics transports as it is at a few hundred meters of distance from Line A Underground stops of Barberini and Spagna..
Booking a Private Car (pickup) which brings you directly to the Hotel at the cost of € 55.00 (price valid until 3 people with modest luggage - from 22.00 am to 6.00 am the price will be a surcharge of € 10.00). A driver will wait for you at the exit of Custom Office of the airport with a signboard with your name and the name of Hotel Julia. Request a private pickup. Taking the train Leonardo Express whitch stops in Termini Railway Station (center of Rome) at the cost of € 14,00 per person an then taking the Line A Underground to Barberini stop (less than 5 minutes walking). Taking a Taxi (Cab) at the approximate cost of € 48,00/58,00. Taking the Cotral Bus (from 6:00 am til 10:40 pm) and getting off at Anagnina Line A Underground stop. Then, take the Underground (Line A) direction Battistini and get off at Barberini stop (less than 5 minutes walking). Taking a Terravision Bus at the cost of cost € 8.00 (from 8:40 am till 00:20, available only for the following flyghts company passengers: Ryanair, Easyjet, Hapag Lloyd Express, Wizzair, Smart Wings) directed to Termini railway Station and then the Underground (Line A) to Barberini stop (less than 5 minutes walking). Taking a Taxi (Cab) at the approximate cost of € 42,00/52,00. We are in ZTL (restricted traffic zone), where access is restricted to residents only. Non-residents can access every day after 18:00 on Saturday morning until 14:00 and Sundays for the entire day. You can use a private car park (Parking Ludovisi) near our hotel (Via Ludovisi , 60 Tel 06/4740632) at a cost of approximately Euro 18,00 / 20,00 per day. Line A Anagnina - Battistini: Get off Barberini. Line B Laurentina - Rebibbia: Get off Termini, take Line A, get off Barberini. Hotel Julia is located in the centre of Rome and it is easily accessible via bus with lines that stop in Via del Tritone. From Termini Station: take subway Line A direction Battistini and get off Barberini. Walk along Via delle Quattro Fontane before turning right into Via Rasella.